OK, I’m giving away one of my greatest hits here. I make these and take them to parties, out on picnics, or just for good healthy snacking at home. They’ve become a bit of a fad food recently but they’ll never go out of style. How cool is it to eat a salad in your hands like this? Feel free to stuff these with anything you like, on the show I kept it totally vegetarian but you can add shredded meat or whole shrimps or cubes of tofu. You can also go the sweet route using fruits and nuts. It’s all good! Don’t freak out if this takes a few attempts. I have NEVER made a perfect roll on the first try and I’ve been doing this for years. So be prepared to have a handful of failures before you get your groove on. Get a kettle and boil some water. Pour a couple of inches into a pie plate or even a skillet—something big enough to hold and submerge your rice paper. Take one sheet of the stiff rice paper from its package and give it a bath in HOT water for about 20 to 30 seconds…this allows it to soften up and become pliable. Carefully remove the paper from the bath and gently fan the sheet a few times back and forth to drip excess water off. Lay it down on a cutting board. 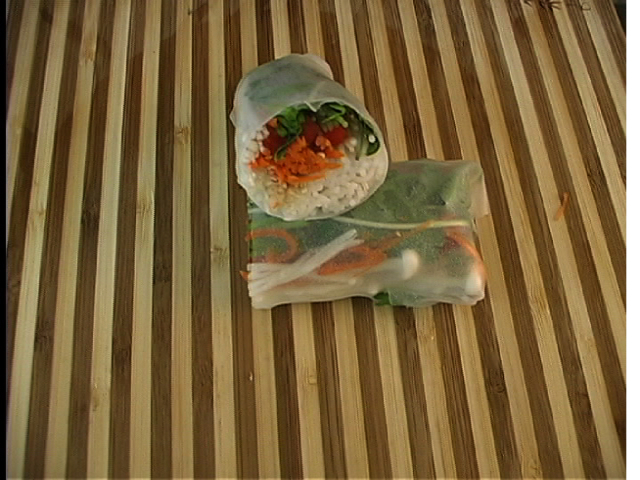 Treat the rice paper like a tortilla and pretend you’re about to roll a small burrito! Place a small pile of your ingredients just off center, roll it up a little bit to secure the pile, fold and tuck the ends in and finish rolling. Try and see if you can make a tighter roll once you are comfortable with the basic technique. There’s no real secret to this, just do it the way that works best for you. If you want to make a bunch of these and eat them later in the day, I warp them in plastic wrap or put them in an airtight container with a warm, damp towel on top. You are ready to eat! Dip these into a ponzu or a wasabi mayo or a more traditional Vietnamese Nuoc Cham. Nuoc Cham is a traditional Vietnamese dipping sauce. You’ll find a jar of it sitting on the table at any Vietnamese restaurant. It’s damn tasty! This is a basic recipe; I usually eyeball it and make it to taste.